Online. Anywhere, anytime. Preferably for free and with a minimum of effort. The Public Spot solutions from LANCOM fulfill this wish for your visitors and, at the same time, they securely separate the guest network from your company’s network. What’s more, LANCOM solutions adapt perfectly to the size of your network—and your budget. An open interface makes it easy to integrate external systems without problem. Easy-to-use Internet access is taken for granted these days. Even on vacation or on business trips, your guests want to go online. But that’s not all: Since January 2015, a minimum requirement of two-star hotels in Germany and 14 other European countries is to offer Internet access in their public areas such as the lobby or bar. To earn three stars, Wi-Fi has to be available in the rooms. 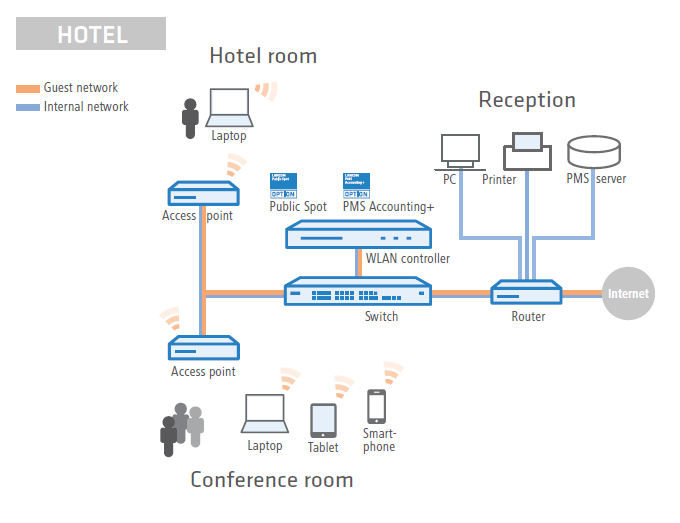 Hotspot solutions by LANCOM are secure, easy to use, and they come with an extensive range of features: For example, with the Smart Ticket feature, your guests receive their access data conveniently via SMS or e-mail—this saves your guests having to go to reception, and it saves work for your front-desk staff, who can get on with other tasks instead. And it gets even easier: In combination with a property management system (PMS) such as Micros Opera, Fidelio Suite8, or Protel, the LANCOM Public Spot PMS Accounting Plus option makes it easy and convenient for visitors to login to and pay for guest Internet access. The open interface structure makes it easy to connect to external hotspot providers and solutions. At any company with a complex network structure, the flexibility and stability of Internet access is extremely important. Also, customers and visitors should be offered guest access that is securely separated from the internal network. With the devices and the Public Spot option from LANCOM, these scenarios are easy to implement. 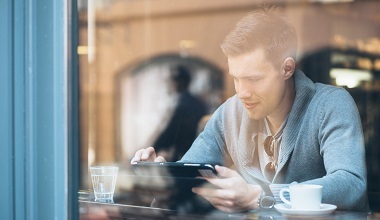 Companies can use a hotspot solution to give visitors Internet access on their own mobile devices (Bring Your Own Device) using a separate guest network, not only at the company main office but also at networked branch offices. Access to the company’s internal data is reserved for authorized employees only.